The Hybrid Connector from CPC eliminates the need for multiple connections and simplifies the user interface between remote tools and a device. Featuring an easy-to-use twist latch to securely connect everything in one simple motion, technicians can quickly change or replace modular tools, umbilicals or hand pieces that require a combination of power, signal, air or fluids. 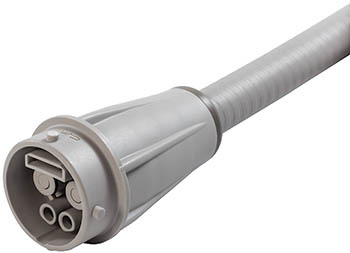 Featuring dry-break technology, the Hybrid Connector allows designers to confidently specify a single connector for both fluids and electronics. The streamlined interface allows design engineers to adapt the product to their needs with many customization options available. Save your valuable engineering resources with this off-the-shelf, turnkey solution or a customized version for your specific application. Custom options available Flexibility to add additional fluid connector or elect contacts.